"This is no flawed logic from the Canada-based company, given that the experience of streaming and networking on an AVR often falls short of that offered by many external devices. Instead of all those distractions, the company entices buyers with its Anthem Room Correction (ARC) feature, which ups the ante massively in the calibration stakes for a consumer AVR." "The flip side to this reduced feature count is that ARC has been revamped and improved, and now runs on a network-connected Windows laptop rather than the ponderously slow RS232C conduit of before." "Another area which is greatly improved is the design of the AVR. The fascia is now cleaner with low-profile buttons and a symmetrical layout. The dot matrix display does exactly what you’d want it to. All in all, it's very nice." "Overall, it's impossible not to recommend the MRX 510 enough." "The same sense of aesthetic satisfaction applies to the menu system. The GUI lacks fancy icons but comprises a logically laid out list of contents with a clear font and a neat red-and-white colour scheme. Everything is highly legible and easy to adjust using the remote." 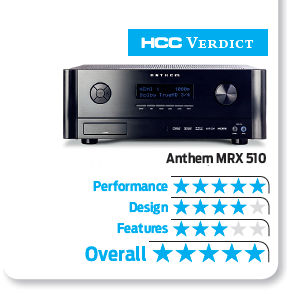 5 Stars for the MRX 510! "You can choose to run the MRX 510 with ARC off, but why would you? That'd be like trying to drive down the Kirkstone Pass in neutral. Without braking. Put simply, the control it exerts when added is profound." "The beauty here is that the low-end impact feels immense but the Anthem's total authority means every element of the soundstage is perfectly optimised." "Overall, it’s impossible not to recommend the MRX 510 enough. For an AVR, sonic performance is of paramount importance, and the Anthem's full-bodied, tight and atmospheric aural delivery makes it an imperative purchase." Click here! 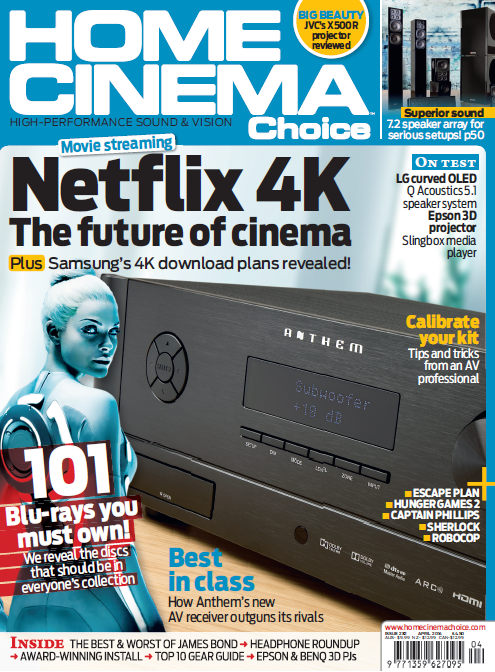 to read the MRX 510 review by Home Cinema Choice. Click here! 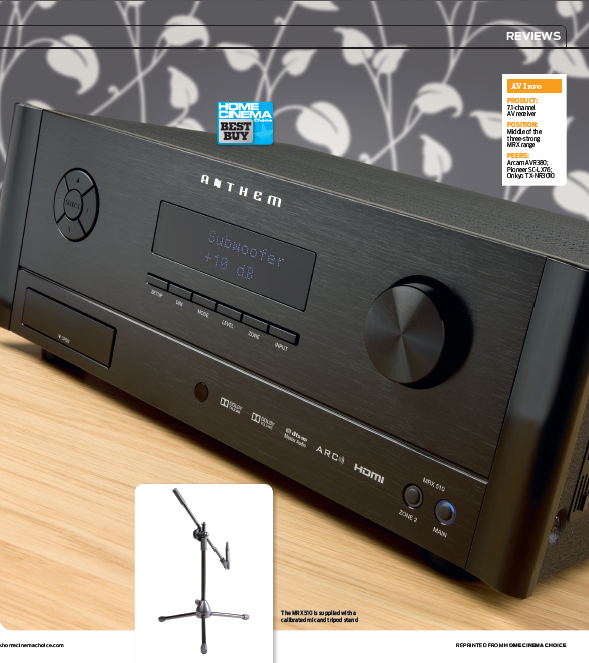 for more info on Anthem's MRX a/v receivers.